A writer’s life is a highly vulnerable, almost naked activity. We don’t have to weep about that. The writer makes his choice and is stuck with it. But it is true to say that you are open to all the winds, some of them icy indeed. You are out on your own, out on a limb. You find no shelter, no protection – unless you lie – in which case of course you have constructed your own protection and, it could be argued, become a politician to define the real truth of our lives and our societies is a crucial obligation which devolves upon us all. It is in fact mandatory. Like past years, the organizers and individuals participating in Jaipur Literature Festival have revealed their deplorable callousness towards collapsing ecosystem, rampant human rights violations and corrupt practices of many of its sponsors. Three years back when the issue of sponsorship by notorious corporations like Rio Tinto, Shell, Shell, Coca Cola, Tata, DSC etc. was brought out, the director of the festival William Dalrymple told media that they would examine the issue. It is clear that they did not do that. It seems the philosophy of the festival is guided by the dictum ‘We are not here as the guardians or gatekeepers of morality and we have not looked at the colour of money.’ as expressed by Sanjoy Roy then. Mr Roy is the head of the company that organises the festival. 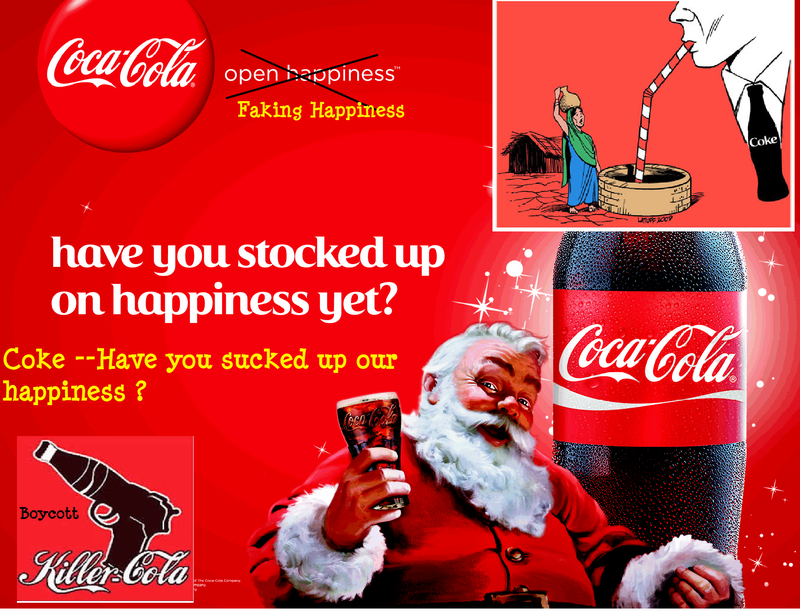 Coca Cola Company has dried up groundwater and local wells that has forced residents to rely on water supplies from outside their areas and the immorality of the Company’s water-intensive bottling plants in Plachimada, Kerala and Kala Dera, Rajasthan. The same situation is witnessed in and around the areas of almost 52 water-intensive bottling plants of the company in India. The US government institutions like American Centre have failed to reveal as to why there are some 702 military installations of world’s super power throughout the world in 132 countries along with 8,000 active and operational nuclear warheads? We must remember how US Congress that recommended the passage of the US Information and Educational Exchange Act on January 27, 1948 declared that “truth can be a powerful weapon”. Drawing lessons from the amendments to the US Foreign Relations Authorization Act of 1972 in July 2010 that banned disseminating within the USA any “information about the United States, its people, and its policies” prepared for dissemination abroad with the aim to engage in a global struggle for minds and wills to bolster its “strategic communications and public diplomacy capacity on all fronts and mediums – especially online”. This reveals that US government’s relationship with the non US citizens is not healthy. > DSC Limited, the principal sponsor till the last year and the sponsor of the main literary prize awarded at the event, was awarded 23% higher rates in the matter of scam ridden Commonwealth Games as per the observation of Central Vigilance Commission. Is literature interested only in lies that create a make belief reality? If writers at the festival believe that a better life is possible and should be achieved, it would be germane for them to ponder how being complicit in promoting status quo is contrary to their beliefs? Is it not possible that a literature festival supported by unethical and immoral business enterprises is an exercise aimed at clinical manipulation masquerading as a feel good event akin to be an act of hypnosis? The writers at the festival must ponder over: what is the immoral equivalent of taking sponsorship from such corporations and institutions that destroy environment and violet people’s rights in most brazen manner. One hope the Jaipur Literary festival and those participating in it will pay heed to Pinter’s advice and undo its unwitting acts of Faustian bargain before it is too late. We appeal to the writers attending the festival that commenced on 17th January, 2014 to condemn corporate crimes, motivated public opinion engineering and state sponsored acts against humanity and disassociate from events that are sponsored by dubious sources.